Orbs are circular anomalies seen in photographs, thought by some people to be paranormal in origin. This is an introduction to orbs, based primarily on ASSAP's extensive research on the subject. The links from here contain much more detail on each topic discussed. Q: How do you recognise an orb? A: Orbs are circular (though rarely they can be other shapes such as diamond-shaped) and usually grey or white in colour. They appear in photographs, or videos, having not been seen by the photographer at the time of exposure. If you see a circular object at the time of exposure, and it appears in the resulting photo, it is not an orb but something else. Most orbs occur when a camera is used with flash. For more on the photo (right), see here. Briefly, the orb zone theory says that orbs are the strongly-illuminated (usually by flash) highlights of out-of-focus bits of dust, insects, water droplets etc. Q: How are orbs produced? A: Most digital cameras have lenses with a much greater depth of field than film cameras. This means that the nearest point to the camera that is in focus is a lot closer. It also brings the 'just out of focus' area (the 'orb zone') closer as well. The 'orb zone' is so close to the camera that it is intensely illuminated by the flash. The intensity of the flash increases according to an inverse square law with decreasing distance. So, if the subject of your photograph is at a distance of 5m, a particle of dust at 5cm from the camera receives approximately 10,000 times greater light intensity! This creates an 'orb zone' in digital cameras where the light intensity is sufficient to illuminate the faint out-of-focus bits of dust, which then appear as orbs. The graph shows flash illumination intensity (vertical axis) diminishing with distance (horizontal axis). The objects referred to below are tiny things like bits of dust. In a film camera (or digital cameras with physically large sensors like 'full frame'), all the zones move further out and the 'orb zone' generally vanishes because there is insufficient flash intensity at the increased distance. It is the physical size of the sensor, not the number of megapixels, which is important. 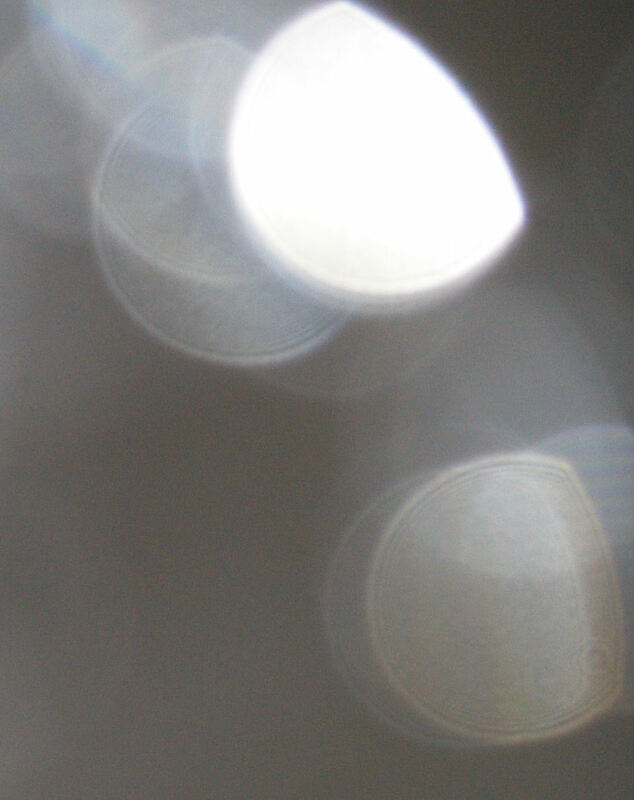 Orbs are more prevalent in compact cameras which generally have physically small sensors. Q: Why are orbs usually circular? A: When an object goes out of focus, individual highlights on it become circles (or more rarely other regular shapes) in a photograph. The circles themselves can appear quite sharp but the object they represent becomes fuzzy, turning into a series of overlapping circles (see photo of screws below). You never normally see this effect with the naked eye which is probably why orbs appear odd. The diagram (right) shows a digital camera with a single lens projecting an image onto a CCD (the chip that records pictures - could also be MOS or any other digital sensor). In front of the lens there are two tiny points of light. The one labeled 'A' is far enough from the lens to be in focus. 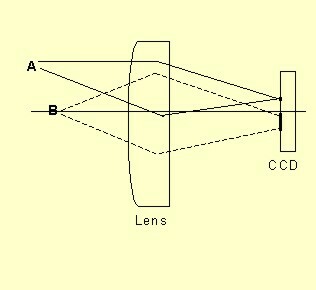 The continuous lines show how a sharp point image of 'A' is formed on the CCD. The point 'B', however, is too close to the camera to be in focus. As a result, the dotted lines show how it becomes spread-out on the CCD, even though 'B' is just a point source of light. This spread-out image appears as a circle. This circle can, if the point of light is a highlight produced by dust, an insect, water droplet etc, appear as an isolated orb. Though the circle may appear sharp-edged, it is actually an out of focus representation of a point. 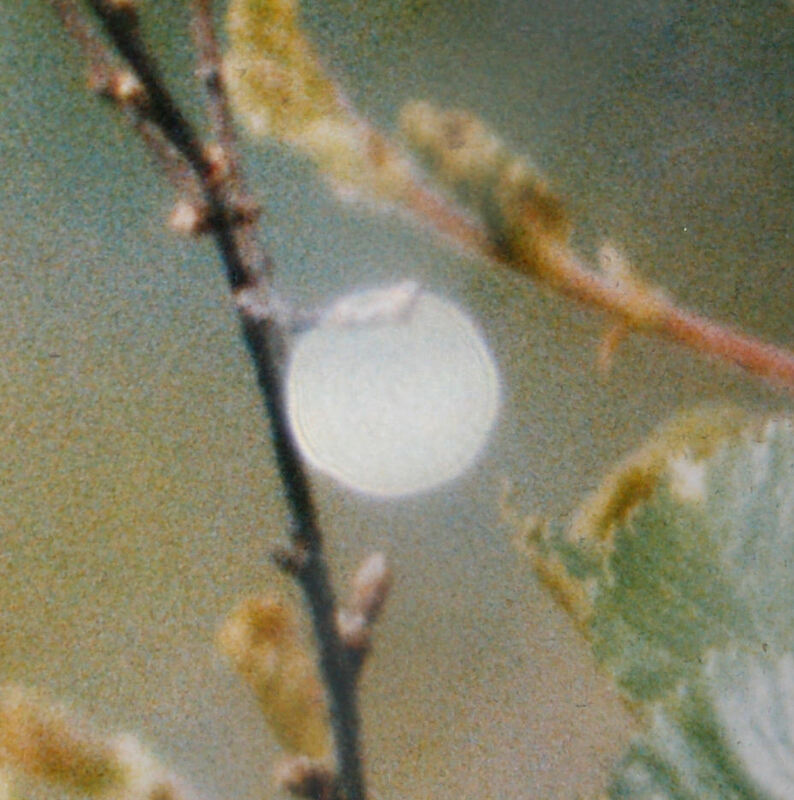 Orbs can be shapes other than circular, depending on the shape of the aperture inside the lens. The aperture is a hole which is varied in size by the camera, usually automatically, to let more of less light through depending on the lighting conditions for the photo being taken. It can be diamond-shaped (photo right), octagonal or other regular shapes. 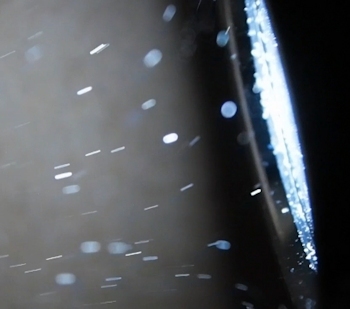 You can see the video of dust turning into diamond-shaped orbs here. These non-circular orbs are one of the important indicators that orbs are a phenomenon caused by the camera itself rather than the object being photographed, such as a dust particle. That's because all orbs photographed by a particular camera are always the same shape. If orbs were a phenomenon external to the camera, this should not happen. Q: Can you see the orb zone working? A: It is possible to visualize the effect of the orb zone by photographing objects near to the lens. 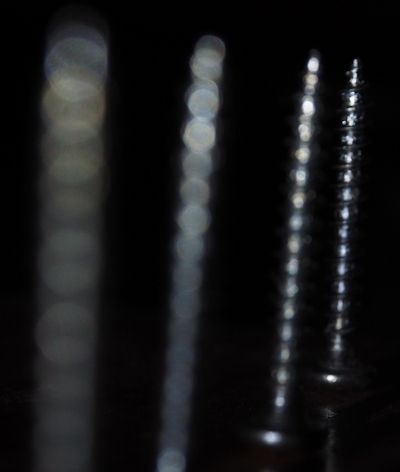 In this photo (right) you can see four identical silver coloured screws standing vertically. They are arranged in a line going away from the lens with the nearest on the left. The screw furthest away, at the right of the photo, is in focus. The others are all out of focus. The furthest (right-most) screw is outside the orb zone while the others are inside it. The highlights of each screw become circles when they are too close to be in focus. The circles are larger and less bright in the screws nearest to the camera. It is possible, in this way to see the effect of the orb zone. If the screws were replaced with bits of dust they would appear as single orbs. That's because dust is so small that it generally only has one highlight. However, large bits of dust can produce groups of overlapping orbs, like those in the nearest (left-most) screw. You can see a video (here) where a group of overlapping orbs moves away from the camera, leaving the orb zone, and is revealed as a large bit of dust. The overlapping orbs get smaller and brighter as they move away from the camera, just like the circles in this photo. Q: Can you see dust becoming orbs? A: It is possible to video dust becoming orbs as it approaches the camera, entering the orb zone in the video here. 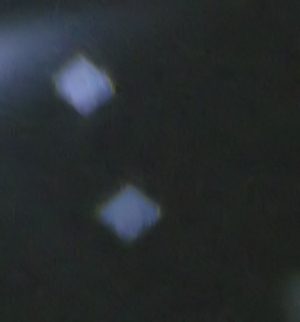 When the dust is in focus in the video it mainly appears as moving bright lines or streaks, rather than dots. This is because the dust is moving relatively quickly and the dots are motion-blurred to become bright streaks. Many of these dust particles turn into orbs as they move. Just before they turn into orbs, some of the dust particles turn into the more obvious dots you might expect to see. That's because most of the particles swing upwards as they approach the torch. As they do so, their motion-blur disappears because we are watching them approaching from above. Also, this upward motion brings them into the orb zone which is why they then become orbs. If you follow individual dust particles in the slow motion sections you can see this happen. The orbs finally vanish when they exit the orb zone at the point where the torch no longer illuminates them. The photo (right) is a grab from the video. You can see the dust particles as motion-blurred light streaks going towards the torch on the right. Near the torch you can see the ones that have already arrived and turned into orbs. Notice how the orbs start out white when they are small and become blue as they expand. The colour probably comes from a blue tinge in the torch light. You can see hints of blue in the torch itself in the photo here. Q: Could a tiny proportion of orbs be paranormal? There are lots of other such apparent circumstances which appear to challenge the idea that all orbs are caused naturally. There is a long list of such points, and their answers, here. New points are are raised from time to time but, so far, they have all been answered satisfactorily by the orb zone theory. At the moment there is, therefore, no evidence of any paranormal orbs. Q: What about explanations other than the orb zone theory? For more on these orb topics and many more, see here. For answers to many other questions on orbs, see the extensive FAQ here.